Is the spine made of aluminum as well? &nbsp;I am looking for a binder that will withstand extreme weather conditions...both heat and freezing temperatures. &nbsp;Regular binders split so I was hoping this binder was aluminum all the way through. &nbsp;thanks. Hi Allie. Yes, these binders are aluminum through and through and should do just fine in varying temperatures. We do not have that option, sorry for any inconvenience this may cause. 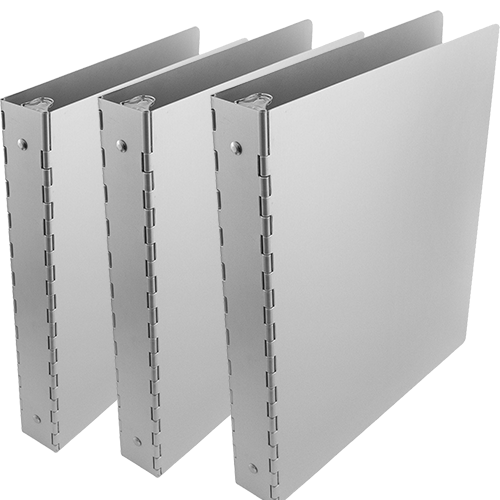 Silver Binders are available in our 1" aluminum binder design. Made of strong and reliable plastic material, you can be sure that it will last you through the work or school year. It also keeps things secure so you can travel from place to place with your essential materials. An inside pocket gives you a place to hold your business cards, discs, and other loose items. Stay organized and get things done efficiently. The 1" aluminum binder is the ultimate protector. Perfect for outdoor professionals like construction workers, engineers, woodsmen, and more. This three ring binder will not only keep your things organized, but will also keep them safe from the elements. And the size isn't too small for those bigger essays, presentations, or documents and isn't too big that it gets annoying to carry ayound. Want another color? Click on our 'Binders - by Color' page on the top of the picture to look for a bunch of colors, styles, and sizes.